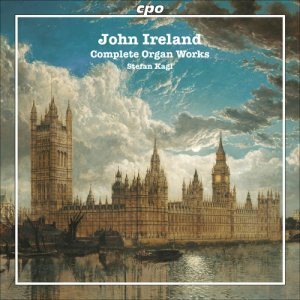 This disc presents works by John Ireland for organ. The music included ranges from the early Elegiac Romance, composed in1902, through the Alla Marcia and Sursum Corda of 1911 and Miniature Suite of 1912 to the Meditation on John Keble’s Rogationtide Hymn, the last work Ireland ever composed, in 1958. Some of the pieces featured are arrangements for organ of works he wrote for other instruments, such as Cavatina and the much-loved Holy Boy, either made by Ireland himself, or by others - Alec Rowley in the case of the Elegy from the Downland Suite, or Robert Gower in the case of the Epic March. Stefan Kagl is an enthusiastic and persuasive advocate for these works - he wrote the good booklet notes as well - but I rather regret that I failed to find the music itself particularly inspiring; the pieces comprise rather four-square, symmetrical phrases, predictable melodic and harmonic directions and stock gestures that render the individual works rather similar in tone and character. The sound of the instrument also is not the most inspiring - slightly muddy or woolly for the most part, whilst some of the stops come over as nasal or sharp - this could, however, be the quality of the recording. Kagl’s performances do their best in these slightly unpromising circumstances. The registration employed is appropriate, if not startlingly imaginative. The rhythms are well-marked where they need to be. The lyrical character of pieces is aptly-captured - some good legatos. The pacing allows the music to breathe without impeding the forwards momentum - such as is implied by the compositional structure. The disc’s booklet is well-presented, with clear notes and photographs. It also includes the specifications of the organ, as well as an extensive note on the Herforder Munsterkirche and its organ. A disc that will be of interest to Ireland aficionados, but not one for those who are already not overly-enamoured of this respected British composer.